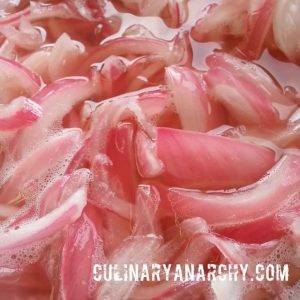 Easy to make and a vastly different approach to using red onions. Simply cut them, add them to the vinegar and sugar mix and let sit for a day or two. They go great on everything from BBQ to Charcuterie plates and is a nice variation on your standard cucumber pickles. I use Mirin which is Rice vinegar but some people use normal white. I don’t recommend using cider or sherry vinegar since the color won’t turn out as bright and they tend to have a stronger flavor.